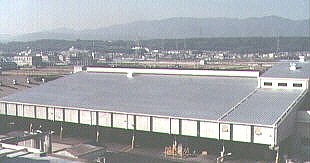 EABASSOC RBC Aluminium is a one coat, reinforced, protective compound for the maintenance of sloping, corrugated metal and asbestos-cement sheet roofs. It is also suitable for over-coating bituminous membranes and mastic asphalt on flat roofs which should have sufficient slope to prevent standing water. It seals and waterproofs, reduces heat gain and protects against corrosion. 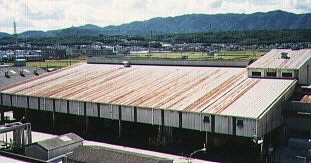 The KIRIN Brewery roof at Kyoto, Japan before RBC Aluminium was applied. RBC Aluminium protective coating applied to the KIRIN Brewery at Kyoto, Japan. EABASSOC RBC Aluminium is a reinforced bitumen waterproofing compound. It produces a membrane with high adhesive strength, but low cohesion. Therefore, unlike elastomeric coatings, it will not delaminate as a single sheet if there is a substrate fault or application error. It is thixotropic, and will smoothly and quickly produce a uniform, durable protective layer. 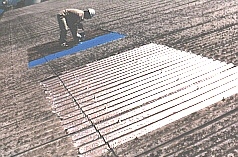 It requires only simple surface preparation, although cracks, holes or open joints should be covered with EABASSOC Flashing Tape. EABASSOC RBC Aluminium is totally resistant to water and so is ideal for use on steel and on fibre cement boards. It seals against water and air, thus preventing corrosion of the former and inhibiting the natural weathering of the latter, which makes such boards thin and porous if they are not protected. It will also seal old, porous asbestos-cement sheets, preventing water penetration. It is not an emulsion, contains no emulsifying agents, and so will not wash off. EABASSOC RBC Aluminium provides a genuine protective coating and is not merely a decorative finish. Other EABASSOC RBC Compounds are available in a range of colours: Red, Dark Green, Dark Blue, Light Green and Light Blue. All are genuine protective coatings.